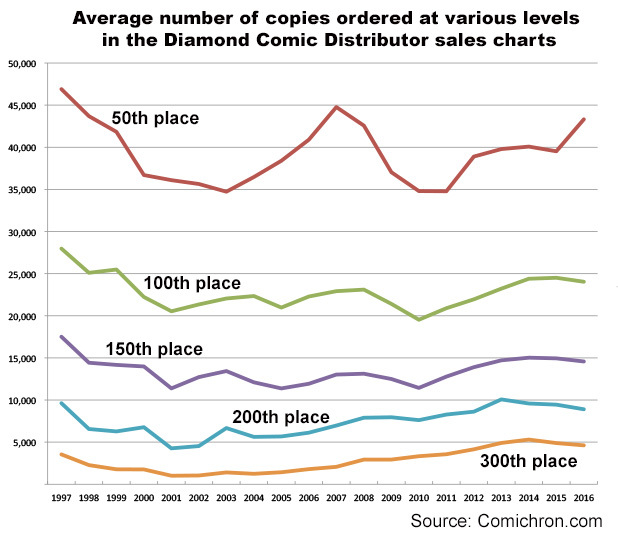 For years, we've had pages on Comichron collecting not just the #1 comic books ordered each month from Diamond Comic Distributors, but also the 300th-place titles, at the far end of the charts. The latter have always been a useful indicator when it comes to evaluating how much depth there is to sales; while volumes at the very top of the list are erratic due to first issue promotions and editorial events, there's much less volatility further down the charts. There are good reasons to look at each of the new benchmarks. At 50th place, we're generally past the larger events and bigger first issue launches, and getting into the meat-and-potatoes books, the regular stalwarts on the charts. At 100th, we're at a level that is useful historically, since in the very early days, the Top 100 lists were all you saw from the distributors. Slot 150 is, of course, dead center of the list each month (well, it's actually between 150 and 151, but never mind) — though the real middle of the list may be closer to 200th place, given the fact that Diamond's slate of comics releases regularly reaches into the 400s. Immediately notable is that there's less volatility in terms of order volume the lower you go down the charts. At 50th place you're dealing with a lot more Marvel and DC titles, so the sales levels are more tied to the fortunes of the Big Two. We see the collapse of the late 1990s bottoming out in 2003, which is actually a bit after the overall market turned around; the peak comes in 2007, followed by a sharp dropoff during the recession of 2009. But once the DC relaunch takes place in 2011, sales at that level turn around. At the lower levels, the bumps are much smoother — and note that at 200th and 300th place, we don't see the recession at all. There's a gradual increase punctuated by a slight downward slope in 2015-16, but sales at 300th place remain higher than they were for most of the past two decades. The reason seems to be the growth of a burgeoning second tier of publishers; with IDW, Dynamite, and Boom, among others, added to the mix in the late 2000s and early 2010s, the number of offerings selling at least 5,000 copies monthly has increased. Clearly, there are a lot of ways to slice-and-dice the data; we probably won't be doing pages for, say, 183rd place across time. But given the attention given to the ups and downs at the highest levels on the charts, it is interesting to see just how much stability there is across time further down. The foundations are relatively sound.